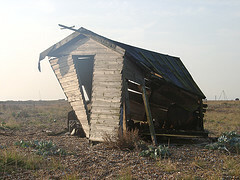 Dungeness Open Studios is revealed as one of Britains' beaches best kept secrets this Sunday June 17, at 9pm. As part of the one hour long programme Nick Crane meets Dungeness Studios' fine artist Paddy Hamilton. Together they experience this wildly beautiful shingle foreland through, printmaking, conversation and storytelling. 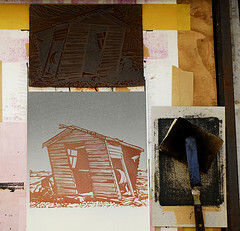 Paddy Hamilton, the artist, commented: "This episode of Coast was fimed about a year ago - Nick Crane showed a great deal of insight into how I made artwork out of the very stuff of Dungeness itself, he was particularly caught by the honest toil required of the printmaking process in the main beach studio A.K.A. The Laboratory. "The visit culminated with Nick revealing his own print from the Twister winch shed series on camera." Two beautiful fine art open studios in the shadow of the black lighthouse on beach at Dungeness in Kent UK. All paintings, prints and drawings on show are made to a high standard finish in a third studio to the right of Studio 2 and completed over a short period of time in early morning sessions in these two buildings. Studio 1 is used as a 'clean space' for colouring and assessing relief prints. Studio 2 is used as a showing space for new projects or as a viewing space for individual works seen online. As soon as paintings, prints or drawings are more or less completed they are previewed here prior to purchase or further exhibition. We do not consider these spaces to be a 'gallery' as such- more a public extension of a continuing working practice enabling the preview of work in a bright, clean and organised environment.